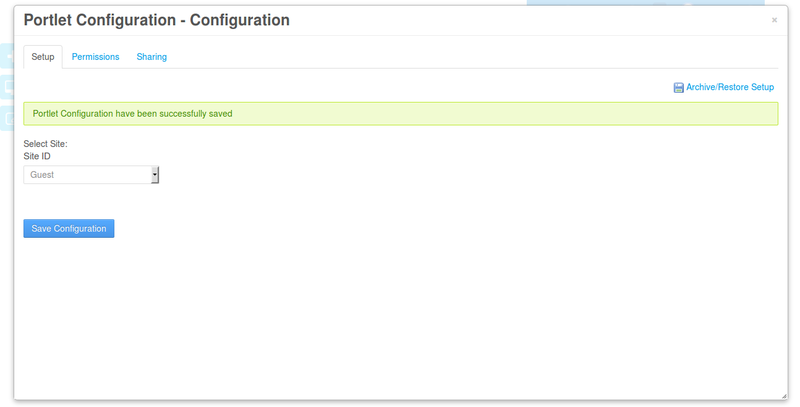 Liferay configuration page provides a way to store portlet related configurations. Generally in the development we may need to store portlet specific configurations and we need one user interface page to input some values and store into database. These portlet specific configuration will be stored in portlet preferences table. To input these values we will use portlet configuration page there we can design user interface to submit values and page can be access through portlet configuration icon that is at top right corner of portlet it can see visible when we drag and drop the portlet in the page. In our custom portlet we want to display Site specific users in the portlet. We will store Site Id in portlet preferences and we will take site Id to get site ,form the site we will fetch users to display it in the table. to set these portlet configuration we will use portlet configuration page there user will change site so that user selected site will be stored in portlet preference. Portlet Configuration Page Implementation Steps. First we need to create portlet configuration page and there use will input data. Create form and create requited input elements. In our case we only need select box that should display all sites form there user will select one option. We need to implement Custom Configuration Action class there will capture portlet configurations and will stored as portlet preferences. Our Custom class should implments the ConfigurationAction interface and in the render method we need to specify the configuration JSP page path that was created in the first step. We have processAction(--) method there will write configuration values storing logic and render(---) method we simply specify the portlet configuration jsp page path. We will use portlet preference to store the configuration values. Finally we need to configure the Configuration Implementation java class in liferay-portlet.xml file. We need to give Java class with complete package where it is reside. Create liferay Plugin portlet using Liferay IDE and add following jsp pages and java classes then you can be ready with portlet configuration page. In download you can see source code and war file you can use war file to deploy directly in your portal server and this portlet was developed using Liferay 6.2 Plugins SDK. Go to Portlet configuration page click on portlet configuration icon then you can see portlet configuration page. Finally selected site users will be displayed in the portlet view page and we can change site name when ever we want like simple go to configuration page select the site name.